Sterling Systems & Controls, Inc. customizes each and every project to meet the exacting needs of each customer. Often that requires the providing of a combination of mechanical process equipment, electrical process controls and automation equipment and systems. Sterling Systems’ has the 45+ years of experience and cap[abilities in mechanical and electrical engineering, process knowledge and automation hardware and programming to be flexible for providing what is needed in each case. In the baking and food industry there are several major manufacturers of bread crumbs for both general and specific use. Sterling Systems’ experience in this application area is highlighted here. Front End Batching and Baking automation and controls. Back End Grinding, Drying and Packaging automation and controls. To accomplish the above, the process control and automation system provides setpoint batching control, coordinates interlocks with downstream equipment, and provides communication, process and equipment monitoring, and alarming with all equipment in production lines. 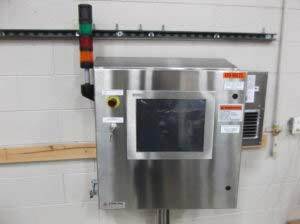 The equipment provided by Sterling Systems & Controls, Inc. for this application include two (2) HMI Control Panels; one (1) installed near the Mixing area and one (1) near the Dryer/Grinder area. 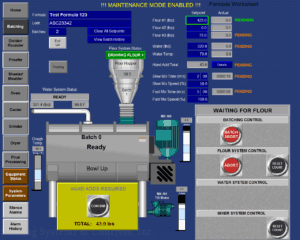 The Mixer HMI control panel provides the primary operator interface for the batching operation. The Dryer/Grinder HMI panel provides the primary interface for monitoring the dryer and grinder operation and control. Although each HMI control panel has its own primary purpose, both HMI control panels run the same HMI application program, thereby allowing access to any screen in the entire automation system from either HMI panel. This provides backup functionality if one (1) HMI control panel goes down. All process equipment control is via push-button control stations located near the individual pieces of equipment, or via third party control systems for the Oven and Dryer, although this all could have easily been integrated into the Sterling Systems’ automation and control system. All communication with existing third party PLC’s is via EtherNet/IP. There is NO database in the Sterling Systems’ control system architecture, and NO formulation information is stored. By custom design and customer requirement all batching is setpoint based and requires an operator to type in the setpoint values before starting the system. 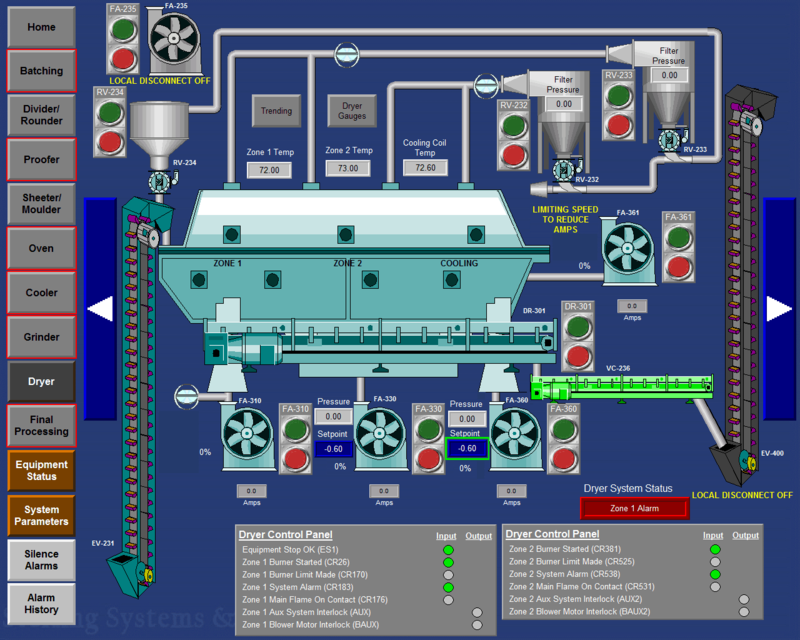 After review with our customer Sterling Systems & Controls, Inc. proposed and provided Manual/Off/Auto Equipment Control in a clean, easy-to-operate and modern approach which follows common standards in the industry. All process equipment displayed on the HMI control panel screens, that is directly controlled by the Sterling Systems’ PLC, contains a Manual/Off/Auto pop-up screen which is accessible when the HMI control panel Key switch is placed in the Maintenance Mode position. After the Maintenance Mode is turned on, the authorized user can tap/click on the equipment graphic to pop up the control screen and control the mode of each piece of equipment individually. When the Maintenance Mode Key Switch is turned back off, the process equipment will return to the Automatic mode of operation. of equipment into OFF mode. switches will ALWAYS be monitored in both Automatic and Manual modes and cannot be bypassed via the automated control system. By providing onscreen Manual-Off-Auto control, the system is more in line with industry standards and provides for easier maintenance and troubleshooting of individual pieces of equipment. The Front End Batching and Baking Sequence of Operation deals with the equipment from the Mixer, through the Divider, Rounder, Spiral Proofer, Sheeter, Moulder, Oven, Spiral Cooler, to the Staling Room. The general control sequence when the system is NOT in Maintenance Mode and All Equipment is in Automatic Mode will be as custom designed and programmed by Sterling Systems & Controls, Inc. for the specific customer process requirements. E-Stops and Equipment Stops are provided for all equipment and panels. These must be pulled out (stop is off) for the system to operate automatically. In this specific application the operator is required to establish setpoints, speeds and other settings for the various pieces of process equipment and then execute start programs via pushbutton or other manner per the equipment manufacturers’ instruction manual. 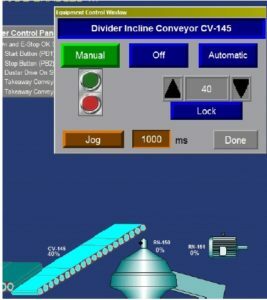 The system integrates other systems and equipment provided by other manufacturers and system providers, providing overall control of the production process through the Sterling Systems’ bread crumb control system. The Back End Grinding, Drying, and Packaging Sequence of Operation deals with the equipment involved with Bread Staling, through the Grinder, Dryer, other brand Mill, and to the Packaging Hopper. The general control sequence when the system is NOT in Maintenance Mode and All Equipment is in Automatic Mode will be as custom designed and programmed by Sterling Systems & Controls, Inc. for the specific customer process requirements. The Sterling Systems’ PLC monitors and controls various pieces of equipment throughout these processes. In this specific application the operator is required to start or stop items and interface with other brand equipment and systems per the equipment manufacturers’ instruction manual. The system integrates other systems and equipment provided by other manufacturers and system providers, providing overall control of the production process through the Sterling Systems’ bread crumb control system.